‘A Synthetic Small Molecule that Walks down a Track’, Max von Delius, Edzard M Geertsema, David A Leigh, Nature Chem, 2, 96-101 (2010). Full Article. News & Views. 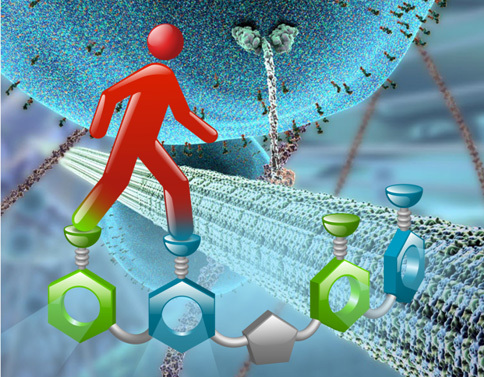 Walk this way: A synthetic small molecule that moves down a track like a motor protein. Credit: Kevin Hänni. The background image shows the biological motor protein kinesin carrying a vesicle cargo whilst ‘walking’ down a microtubule track, and is taken from the fantastic video "Inner Life of the Cell," Harvard University, © 2006 The President and Fellows of Harvard College, created by Robert Lue and Alain Viel, Harvard University, John Liebler, XVIVO, LLC. Molecular motors are used throughout biology to drive chemical systems away from equilibrium, and thereby enable tasks to be performed, cargoes to be directionally transported and work to be done. 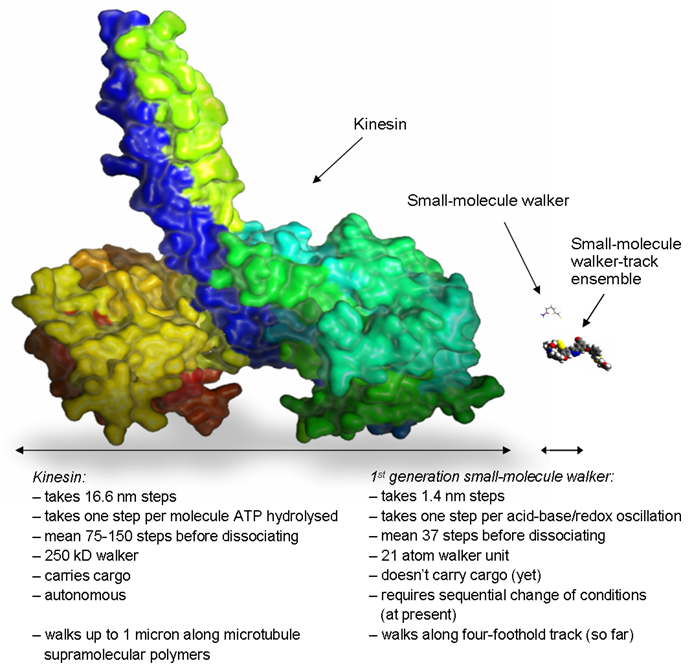 Spectacular examples include the ‘walking’ proteins kinesin (see picture), myosin and dynein, which are driven along their cellular tracks powered by the consumption of ATP. A team of chemists from the Leigh group has now described  the first small-molecule  system in which a ‘walker’ can be transported directionally along a short molecular track in a manner reminiscent of the way that biological motor proteins ‘walk’ along biopolymers in the cell. The ultimate goal of such studies is to produce artificial, linear molecular motors that move directionally along polymeric tracks to transport cargoes and perform complex tasks at the nanoscale. The mode of operation of the system is shown in Figure 1. The walker (shown in red) moves one foot at a time between various ‘footholds’ (green and blue) on the track. While one foot is moving it is a strict requirement that the other remains attached to the track so that the walker does not drift off into the reaction mixture (this property of molecular motor movement is called ‘processivity’ ), and to ensure this happens the feet-track interactions are designed to be dynamic under mutually exclusive sets of chemical conditions . Starting from a position in which the walker is attached to the footholds on the left hand side of the track, treatment with trifluoroacetic acid (TFA, condition I)) leads to about half of the walker units to step onto the middle of the track (Figure 1a and 1c). As indicated by the equilibrium arrows, this process - hydrazone exchange - is fully reversible. During the next step (Figure 1b and 1d) foot ‘A’ needs to remain attached to the track and foot ‘B’ needs to be able to move forward. This is achieved by switching from acid to base (condition II: DBU (1,8-diazabicycloundec-7-ene) and the mild reducing agent DTT (DL-dithiothreitol)), resulting in a second reversible step through disulfide exchange. Repeatedly oscillating between acid and base conditions causes the walker to randomly take steps up and down the track until it reaches a steady-state minimum distribution on the track (Figure 2). The same distribution is eventually reached irrespective of the starting position of the walker on the track. Figure 2. Walking cycles starting from the walker on the left hand side of the track or the right hand side of the track. To drive the walker distribution away from the minimum energy distribution, the reversible conditions II are changed to the irreversible ‘redox’ (reduction-oxidation) conditions III. During the redox process all the disulfide bonds of isomer 2,3-1 are reduced to give the trithiol shown in square brackets in Figure 3a. The trithiol is then quickly and irreversibly oxidised, resulting in a new mixture of 2,3-1 and 3,4-1. Because this reaction pathway is under kinetic control a different reaction outcome compared to condition II can be obtained. The results of successive application of conditions I and III is shown in the table in Figure 3b. 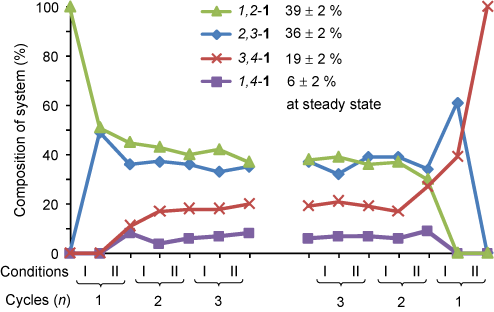 After only three operational steps, 43% of the walker units are connected to footholds 3 and 4, while the corresponding number for the steady state obtained using conditions I and II is only 19%. The walker has been directionally driven away from its thermodynamic minimum by a motor-mechanism that corresponds to an information ratchet type of Brownian ratchet mechanism . Figure 3. (a) Chemistry behind the biased walking step and (b) table showing the outcome of this information ratchet mechanism. Chemists have previously made small-molecule rotary motors , but this is the first example of a synthetic small-molecule linear motor. Even this simple first generation system possesses some of the important characteristics (processive and directional walker transport) that are a feature of biological motor proteins. Figure 4 illustrates the large difference in molecular size between this first small-molecule walker and the motor protein kinesin (DNA walkers  are comparable in size to kinesin). Future work will go into systems with other origins of directional bias, systems with more rigid and extended tracks, and walkers that can capture, transport and release molecular cargoes. 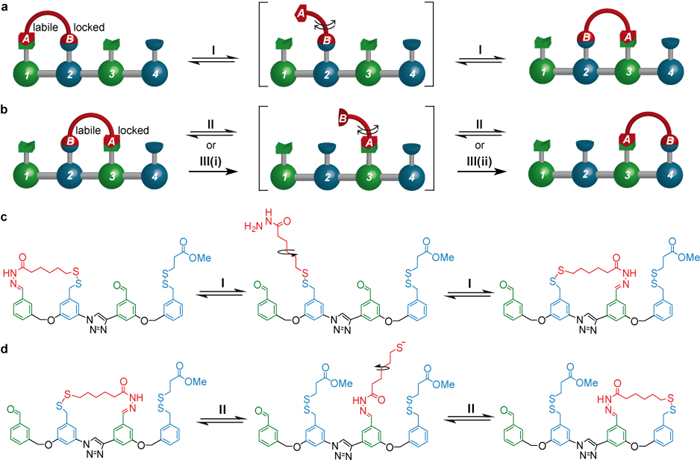 The ultimate goal is to construct small-molecule walkers that can perform work by migrating autonomously and unidirectionally along polymeric, surface-bound tracks. Figure 4. Does size matter? Size comparison of wild type kinesin (left) with the synthetic small-molecule walker (right) and the walker-track conjugate (lower right). Kinesin structure from the pdb protein databank. Small-molecule walker structure optimised using DFT calculations (B3LYP/cc-pVDZ). Credit: Max von Delius and Kevin Hänni. M. von Delius, E. M. Geertsema, D. A. Leigh, Nature Chem., 2, 96-101 (2010). Walking systems based on DNA have been described previously. For two recent examples see: (a) T. Omabegho, R. Sha, N. C. Seeman, Science 324, 67-71 (2009) and (b) S. J. Green, J. Bath, A. J. Turberfield, Phys. Rev. Lett. 101, 238101 (2008). The migration is processive if the walker moiety does not detach from the track or exchanges with other molecules in the bulk via other mechanisms. The chemistry that the feet to reversibly detach from the track (conditions I and II) is termed ‘dynamic covalent chemistry’. For two review articles see: (a) S. J. Rowan et al, Angew. Chem. Int. Ed. 41, 898-952 (2002) and (b) P. T. Corbett et al, Chem. Rev. 106, 3652-3711 (2006). In chemical terms the feet-track interactions must be dynamic under mutually exclusive sets of conditions. For two recent papers which describe this concept for hydrazone and disulfide exchange see: (a) A. G. Orrillo, A. M. Escalante, R. L. E. Furlan, Chem. Commun. 5298-5300 (2008) and (b) Z. Rodriguez-Docampo, S. Otto, Chem. Commun. 5301-5303 (2008). (a) R. D. Astumian, I. Derényi, Eur. Biophys. J. 27, 474-489 (1998). (b) A. Parmeggiani, F. Jülicher, A. Ajdari, J. Prost, Phys. Rev. E 60, 2127-2140 (1999). (c) J. M. R. Parrondo, B. De Cisneros, J. Appl. Phys. A 75, 179-191 (2002). For other molecular information ratchets, see: (d) V. Serreli, C.-F. Lee, E. R. Kay, D. A. Leigh, Nature 445, 523-527 (2007). (e) M. Alvarez-Pérez, S. M. Goldup, D. A. Leigh, A. M. Z. Slawin, J. Am. Chem. Soc. 130, 1836-1838 (2008). (a) N. Koumura, R. W. J. Zijlstra, R. A. van Delden, N. Harada, B. L. Feringa, Nature 401, 152-155 (1999). (b) D. A. Leigh, J. K. Y. Wong, F. Dehez, F. Zerbetto, Nature 424, 174-179 (2003). (c) J. V. Hernandez, E. R. Kay, D. A. Leigh, Science 306, 1532-1537 (2004). (d) S. P. Fletcher, F. Dumur, M. M. Pollard, B. L. Feringa, Science 310, 80-82 (2005).